corresponding inconsistencies and anomalies this is what de-normalization is about. What are the goals of normalization? Ensure data dependencies make sense. What is the result of normalization? What are the levels of normalization? Always follow purist's approach of normalization? data and without any loss of any data/information. specializes in one degree program at a campus i.e. BS, MS or PhD. sufficient to briefly review the basic forms of normalization. 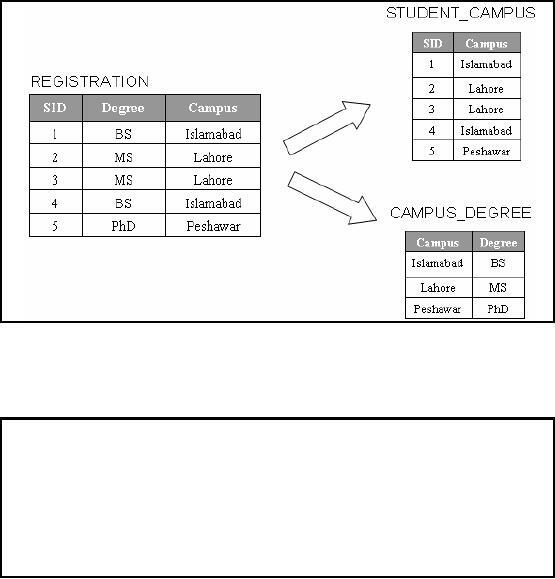 composed of SID and campus is used. added until the student registers for a course. about that student is lost. rows would have to be updated with this new information. 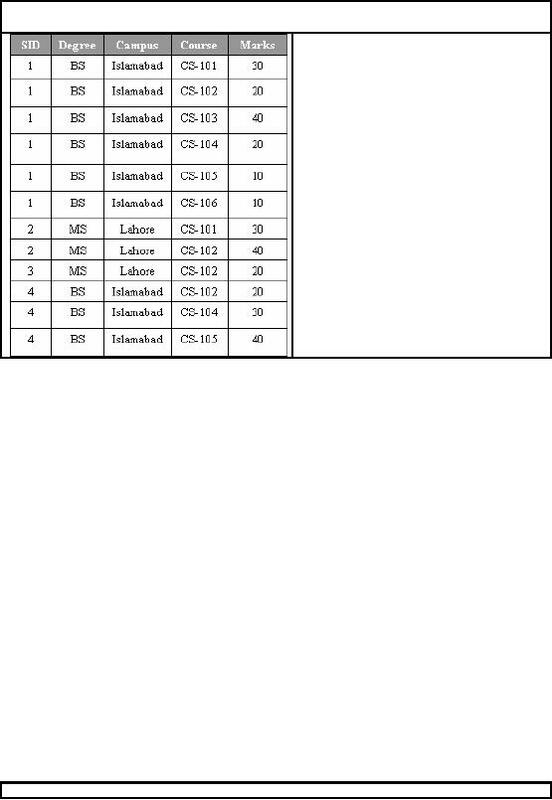 Karachi cannot be added until the student registers for a course. Every non-key column is fully dependent on the PK. 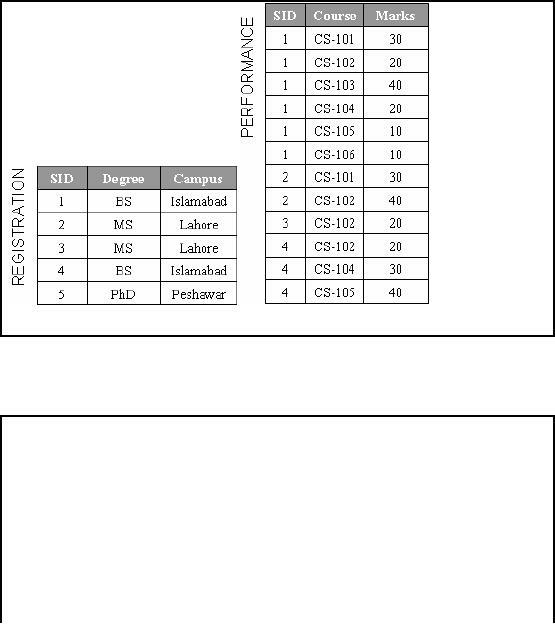 table called REGISTRATION. The column SID becomes the primary key of this new table. in 1NF but not in 2NF. even marks are functionally dependent upon the SID and the campus. called REGISTRATION. The column SID becomes the primary key of this new table. DELETE: Deleting any row from REGISTRATION destroys all other facts in the table. information about the campus as well as the association between student and campus. All columns must be dependent only on the primary key. the primary key (SID, degree). REGISTRATION is in 2NF but not in 3NF because it contains a transitive dependency. is the determinate of other columns. column that is a determinant of the primary key is the determinate of other columns. table is renamed to STUDENT_CAMPUS to reflect its semantic meaning. move the columns campus and degree int o it. 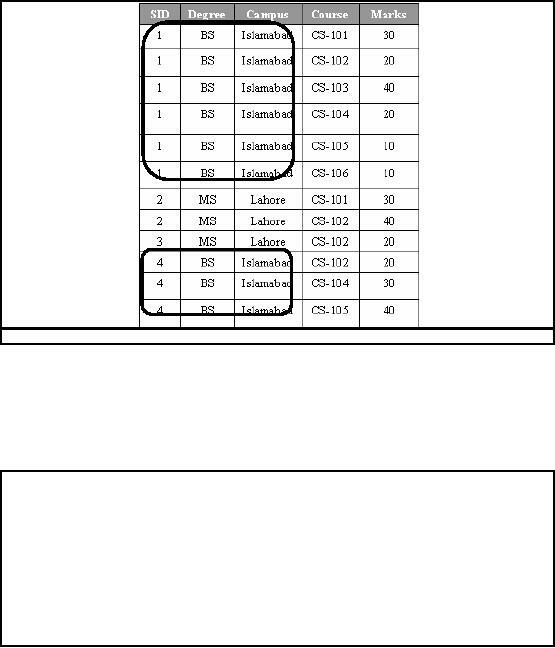 Figure -6.4 shows that the table REGISTRATION is transformed into two tables i.e. the storage space requirement has increased, for this particular example by about 7%. UPDATE: Migrating students between campuses by chang ing a single row. added even though they may not have registered for a course. requires modification of only a single row. a student or a campus. Generally a good idea to only ensure 2NF. 3NF is at the cost of s implicity and performance. There is a 4NF with no multi-valued dependencies. There is also a 5NF. criteria of a 1NF database. best possible use of storage. requirements of 3NF and there must be no multi-valued dependencies. There is also a 5NF, but that is more of academic interest.